The course participants were provided with information and a practical tool for effective integration of equity into health strategies, programmes and activities. The tool consists of a methodological guide developed by the Spanish Ministry of Health, Social Services and Equality. The guide is now being used for addressing specific actions in relation to MDG 4 and 5 (child and maternal health). 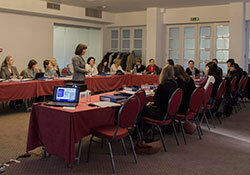 The course, organized in Belgrade, Serbia, focused on the health of the Roma population. The participating experts will further act as trainers themselves on the health equity and social determinants of health approaches to policy-making. “Through this training, we want to contribute to international efforts to ensure that Roma can access services that respond to their basic human rights (including the right to health), in accordance with the efforts of the European Union Framework for National Roma Integration Strategies and the Decade of Roma Inclusion,” said Dr Piroska Östlin, Manager of the Vulnerability and Health Programme in WHO/Europe. The training session also provided a platform for exchange of experiences among the representatives from the four countries (Bulgaria, Montenegro, Serbia and the former Yugoslav Republic of Macedonia ), which are using the guide on a pilot basis within their biennial collaboration agreements with WHO for 2012-2013. The pilot will include a multi-country capacity-building event in 2013 targeting health professionals in decision-making roles. WHO/Europe organized the course for the trainers in collaboration with the WHO Collaborating Centre on Social Inclusion and Health at the University of Alicante and the Spanish Ministry of Health, Social Services and Equality. It was part of an interagency coordination initiative called "Scaling up action towards Millennium Development Goals 4 and 5 in the context of the Decade of Roma Inclusion and in support of National Roma Integration Strategies". WHO facilitates this initiative, which involves the United Nations Population Fund (UNFPA), Office of the High Commissioner for Human Rights (OHCHR), United Nations Development Programme (UNDP), United Nations Children’s Fund (UNICEF) and International Organization for Migration (IOM).